A survey conducted by Italy-based Frigel of NPE 2015 attendees shows that 64.7% of survey respondents rank water conservation as extremely or quite important at their plants. The survey also reveals that process cooling makes up a substantial portion of water usage at most plastic processing operations. It drives the need for continued awareness about the positive impact that advanced systems have on both water savings and their ability to achieve operational efficiencies, according to Frigel Global Marketing Manager, Al Fosco. 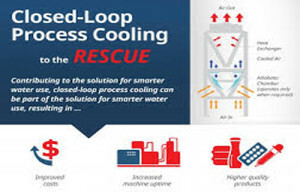 He said it’s clear based on the survey that many companies look to advanced closed-loop process cooling systems to deliver pragmatic business results. 58.6% of the survey respondents said process cooling is extremely or quite important to plant efficiencies. In the survey, nearly 30% said process cooling makes up 60% of overall water consumption at their operations, and an additional 21.6% said it makes up 40%. The survey results come to light in a time when water resources are stressed globally. According to the United Nations Department of Economic and Social Affairs, water scarcity affects every continent and that about 1.2 billion people live in areas of physical scarcity. Further, the United Nations’ World Water Development Report warns that the world could suffer a 40% shortfall in water supply by 2030, and that global water demand for the manufacturing industry is expected to increase by 400% from 2000 to 2050, leading all other sectors. In the US, based on drought levels estimated by US Drought Monitor, the 24/7 Wall St. financial news and opinion company characterized nine Great Plains, Western and Southwest states as “running out of water”. “Our goal is to continue to ensure that people understand that closed-loop process cooling systems can be part of the solution to smarter water use, in addition to plant efficiencies,” declared Mr Fosco.